By the way, the Comic Chameleon thing is still relevant, so if you have a Google+ or Twitter account, give us a quick and easy shout-out! Click here to find out how and why. We’ll leave it up to your imagination for now. It’s a big part of Veronika’s character that she keeps her true feelings and thoughts so suppressed, so I don’t want to speak too much about her. There will be many more chances to see these two interact in the future! That song. Every single time that’s the exact mondegreen my friend heard. It was quite amusing. Incidentally, I like her crown, and I like his hat. Headgear for all! Haha, really? I love mondegreens. You know, my pseudonym is based on one. My favorite musician, Andrew Bird, has a song called Fiery Crash with the line “it’s a nod to mortality” but I always thought it was “it’s an alter mentality” until I looked up the lyrics. He’s always making up words and throwing strange ones together, so it didn’t seem out of place. WhoaaaaAAAA, an explanation to your previous name on this site, and also devientart. I AM LEARNING. I like Veronika’s doorknob…though it might hurt to actually use. And I’m actually really fond of her bird motifs over all! …also, I survived thanks to your advice. Thanks again, for like the millionth time! I think it might not be a knob, and more of a thing you pull to open the door. When’s the last time there’s been a non-dungeon locked door in a Zelda gam, after all? Yeah, I don’t think it can lock. Maybe most of the doors in the castle don’t, because the castle is supposed to be hard to get into in the first place, and trust should prevail within its walls. Also, the princess especially wouldn’t have locking chambers, so that she can easily be “checked on”, “warned”, and “saved”… Why no, it is NOT fun to be her. So that doorknob… do you grab the neck and pull the beak down with your thumb? Is it like one of those door-lever knobs? And did a guy running away from the Ecta Posse faceplant into the ground? I think that is supposed to be a flish. I think it’s a peacock. Then again, I thought the butterfly wallpaper was vines. The door knocker is indeed a peacock. You do grab it by the neck, and I didn’t really think about it having a lever mechanism, but why not! That’s cool. So you grab the peacock by its neck and yank on it every time you want to enter or leave the room? Seems a bit cruel, don’t you think? Look at his track record, though. I’m sure she believed in him in the beginning, but after a while it’s hard to put faith in the kidnapping-prevention abilities of the guy who always fails to prevent the kidnapping. To be fair, she has absolutely no doubt whatsoever that he’ll save her. And also, he’s usually not around when she gets kidnapped. He’s not on constant princess-watch (although he wouldn’t mind). Since “You Can’t Stop Stage One”,has Skærva ever tried one of those plots where ‘doing the evil’ is the stage one, and there’s nothing beyond that? Burning down the capitol seems like a pretty good way to defeat Blank, and he wouldn’t have to rent dungeons or anything. He’d be breaking the meta a bit, but some things just can’t be fixed by going off and adventuring. That’s true. However, Skärva’s plots have turned into a vendetta against Blank personally, both as revenge for all the prior defeats and to make a point: the gods’ accursed versus the gods’ beloved. Blank wouldn’t be able to reverse such destruction, but he wouldn’t be “defeated” exactly. And Skärva doesn’t want to do too much damage to Idenau. He wants to rule it someday, after all! The, um, number 4 with a stick in it so it looks like a backwards R… At least that is how I always interpreted it. Falx is right again. It is a backwards R that is also a 4. I promise there’s no Da Vinci Code stuff or intentional real-world religious symbolism going on in this comic. Not the Second, mabye the Third, and too soon to know about the Fourth. She’s so… resigned to her fate. I’m expecting her to pick up a sword any day now and start slaughtering minions left and right. Blood everywhere, y’no. After all, does Blank actually *have* to save her? Isn’t she capable of saving herself? Maybe it’s a tradition? Generations upon generations of kidnapped princes and princesses being rescued from villains. It might even be frowned on to have a royal kidnapee defend themselves, since OBVIOUSLY it is the will of the gods that they be rescued by the CHOSEN ONE. To be fair, Skärva and Derk are powerful guys, and in a Skärva vs. Veronika fight he would certainly win. However, they don’t want to hurt each other. Blank can defeat Skärva and all his minions with ease because he’s blessed and chosen to do so. Of course, she IS resigned to her fate. Being kidnapped is no worse than being cooped up in the royal castle and surrounded by servants. Other than all the Pink, of course. Maybe she should pack some new decorations? 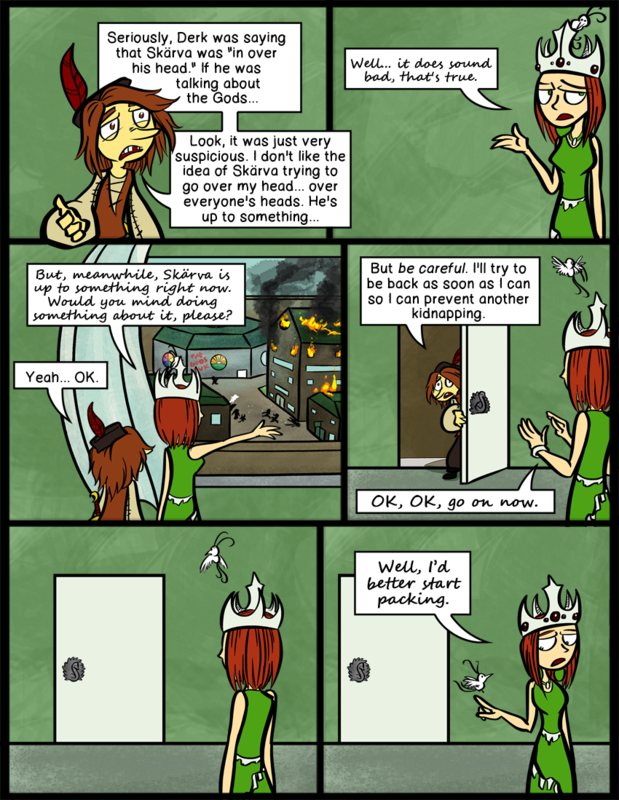 And I’m sure Lord Skaerva would be generous enough to have one of his minions kidnap somebody to paint her room. Okay, maybe not. But she could try. I presumed he had it done in pink on purpose, to aggravate her. After all, prisons are supposed to be filled with stuff you loath, right? I bought some birdcage earrings the other day, and thought of Veronika, actually. …..did you guys ever specify how old Blank and Veronika are? Sorry if someone’s already asked that, but I’m curious. Blank is about 18, Veronika is slightly older. I originally pictured her being in her late 20s, but we decided that we didn’t want her brushing off of Blank to be an age difference thing. wow she has so much faith in that guy. I find her lack of faith amusing. Wow, the minions went from smashing pots to burning down buildings? Or maybe was someone SO frightened by the four that they knocked a candle over? There are more minions than just our Gang of Four here in the city. They have arrived on the scene just to marvel at the chaos.